Suite 309 is a second floor corner unit so it has a lot of natural light and the paint colors and wood accents create a breezy waterfront atmosphere. Comfortable furnishings in the living area encourage naps or a movie night gathered around the flat screen TV. 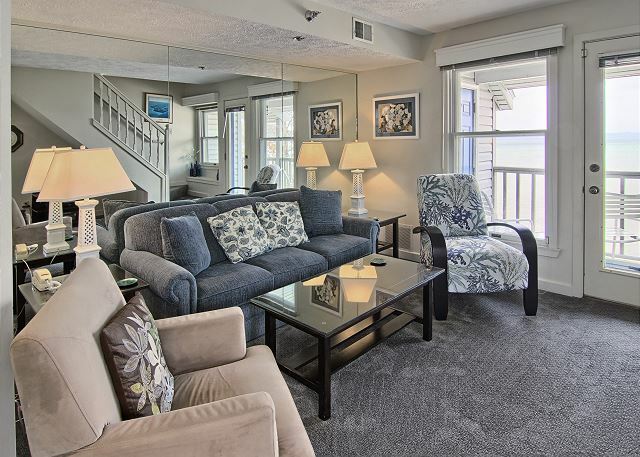 The living room has a sofa sleeper and private terrace with breathtaking waterfront views. We had a great time at the Condo. It was decorated beautifully and exactly what we needed for a girls weekend away. The office staff was friendly and helpful. My only complaint was that there were used sheets on the sofa bed (lots of hair) so we opted to use a blow up mattress and our own sheets. Our experience, while limited to one night, was great. Beds were very comfortable and warm. Plenty of room and the entire condo was very clean. Thanks for your review Ashley, you ladies were hilarious and fun to have stay with us. We look forward to seeing you again next year! - North Shore Inn Mgmt. Hello Carol - We are happy to hear that you enjoyed your "Girls get-a-way" in this condo and we appreciate you providing us with your feedback. I apologize for their not being enough blankets for the beds as there should have been one per bed and an additional one for the sofa sleeper. We certainly would have brought you some had we known there was an issue and am sorry for any oversight on our part. I will ask our maintenance crew to take a look at the shower heads to see what needs to be done to improve the water flow and am sorry for an inconvenience this may have caused. I will also have them look into the dining room table to see if we can secure them better. We always want our guests to have a 5-star experience so please be sure to contact us with any type of disruption of stay should we have the opportunity to earn your business again! Sincerely North Shore Inn Management UPDATE: I just checked with our maintenance team and there is a work order in place for both of the shower heads to be replaced! 🙂 Thanks for letting us know that there was an issue! Check in was easy; easy to work with for late arrival. Conveniently located for the area. Friendly staff. Clean condo. Downstairs bedroom is small but upstairs was very roomy. Balcony with a water view; made a point of stepping out each day in spite of the cold damp weather. We enjoyed our stay and highly recommend this place. We, along with another couple, chose to stay here, as the hotel prices were more expensive than renting this condo. We all got along great, as it was our first time living together on a vacation. Made our own daily breakfast, with everything we needed to cook, before starting the day. The website could be more detailed with telling you all that is included. I had to email numerous times asking if it had a toaster, etc. Nice décor. Gorgeous view! Only wish the lower bedroom was larger. Didn't seem fair that 1 couple got a huge room and the other got a tiny room. Coin toss. The condo itself was clean, but it needed a deep cleaning. But we would definitely do this again! The front desk and maids were all very nice. Whatever you needed, you got! Pool was sparkling clean. Beach was raked daily and the patio area was nice with again, a gorgeous view! Very relaxing vacation! Our condo was fine, if a little cramped and worn. Using "spacious" in the description is a bit of a reach. Everything was clean and comfortable, and the lake view was spectacular.